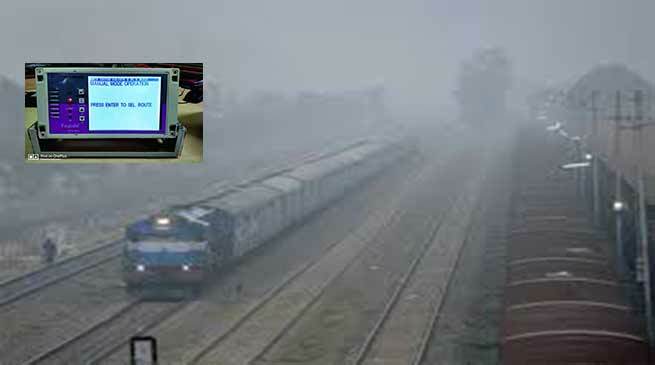 To help in timely running of trains during foggy season, NF Railway installed Fog Pass, a new GPS based system in Trains, which works for auto warning to train drivers. A equipment called FogPASS (Fog Pilot Assistance system for Safety) consisting of an inbuilt battery and GPS antenna with magnetic base has been installed in all locomotives in N.F.Railway. The device which weighs 1.5 kg is carried by the loco pilot at the time of assuming charge of the locomotive. It is placed on the consul of the pilot and as the train moves, it displays short description and remaining distance of next two landmarks in geographical order on LCD screen. Landmarks include signals of various types, level crossing gate etc. This means that as a train approaches a station the device will flash the distance left for the home signal of that station. Thus even if the pilot is unable to physically see the signal, he would be aware of how far train is from the signal and would be alert to notice the aspect of the signal (red, green or yellow) and act accordingly. There is also provision of voice announcement in speakers attached with the device for attention of drivers. The new device has proved to be greatly helpful to drivers in the foggy weather. A total number of 1101 numbers of such devices have already been allotted to all Divisions for fixing in locomotives. Besides, Railways has also deployed Fogmen to place detonators on the tracks to alert the loco pilots about approaching signals. Senior railway officials are undertaking night foot plate inspection and track patrolling to detect cases of rail fracture. Railways have also provided sufficient walkie-talkie sets to the crew and station staff. Signal indication booklets have been provided to loco pilot and counselling on working during fog is also being done. It is to be mentioned here that, during intense fog situation, railways normally face problem of shortage of crew resulting from longer working hours due to slower mobility, heavy crowing of waiting list passengers and non-availability of track maintenance slots due to reduced capacity apart from complete disorientation of timetable. So the new GPS based system named FogPASS is proving to be a boon to speed up train during intense fog situation.